1993 February 26: A Truck bomb is detonated in the parking garage of WTC using explosives provided by the FBI that were not exchanged for inert material "as planned" fails to have desired effect, because the building survives, and does not topple into other buildings. 1997 October: High Energy Density Explosives, JSR-97-110, backup from JASON Defense Advisory Panel Reports - "the use of nanometer sized particulates to exert control over rates of thermite reactions is very interesting, logical and might well find practical application." 2001 September 10: Exit doors to the WTC's roofs are locked to prevent people from escaping to the roof. 2001 August 24 - September 6: Ben Fountain, a Fireman's fund financial analyst spoke of unusual evacuations ordered the weeks before 9/11. Daria Coard, a guard at WTC 1 confirms 12-hour shifts for two weeks due to phone threats. The security alert was lifted five days prior to 9/11, and the bomb sniffing dogs were removed. 9/11 (6:47 am): The WTC 7's fire alarm system is placed on "TEST" mode for an eight hour period for "maintenance or other testing" in which any alarms that are received from the system are not shown on the operator’s display and are considered the result of the maintenance or testing, and are ignored. "Finding 2.25: The fire alarm system that was monitoring WTC 7 sent to the monitoring company only one signal (at 10:00:52 a.m. shortly after the collapse of WTC 2) indicating a fire condition in the building on September 11, 2001. This signal did not contain any specific information about the location of the fire within the building. From the alarm system monitor service view, the building had only one zone, “AREA 1.” The building fire alarm system was placed on TEST for a period of 8 h beginning at 6:47:03 a.m. on September 11, 2001. Ordinarily, this is requested when maintenance or other testing is being performed on the system, so that any alarms that are received from the system are considered the result of the maintenance or testing and are ignored. NIST was told by the monitoring company that for systems placed in the TEST condition, alarm signals are not shown on the operator’s display, but records of the alarm are recorded into the history file." - NIST: Progress Report - Chp 1; (PDF - pg 28). 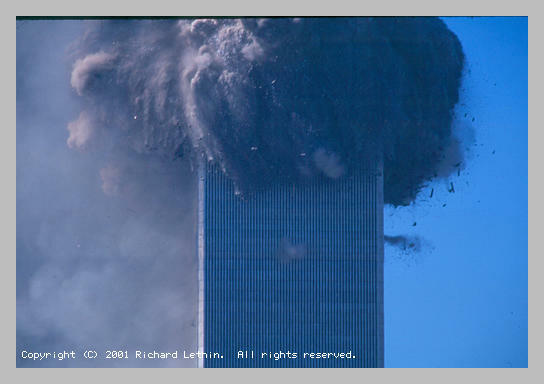 2001 September 11 8:46:40 AM: American Airlines Flight 11 hits WTC 1 (North Tower). It was allegedly a Boeing 767-223 ER on a scheduled flight from Boston to Los Angeles. 2001 September 11 9:02:40 AM: United Airlines Flight 175, slams into the southwest face of WTC 2 (South Tower), creating an impact hole that extends from the 78th to 84th floor. It was allegedly a Boeing 767-222 on a scheduled flight from Boston to Los Angeles. WTC, where the upper flames are from the combustion of paper, furniture, etc. The lower is molten steel from the combustion of thermate. Brigham Young University physicist, Prof. Steven Jones: Yellow molten metal and yellow ash are signatures of thermite. Samples examined with proton induced X-ray emission and electron microprobe detected Iron, sulfur, potassium and maganese in ratios characteristic of nano thermite found in WTC dust. Applying the scientific method to 911 (thoroughly scientific - must read). WTC Secondary Explosions are evidence of demolition. 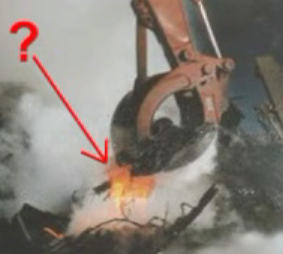 Many video and audio recordings of multiple explosion and molten metal testimony. All such evidence has been removed from YouTube except for a helicopter cop report. The basements had to be collapsed to make room for the rubble from the demolition of the above ground floors so it would not expand sideways into buildings that were to be preserved. Here's the explosion that did it. Here are the squids that collapsed one Tower into its basement. Evidence of corner cutter charges. Mayor Rudi Giuliani says he and the head of FEMA were told that WTC 1 and 2 would collapse? 2001 September 11 9:58:59 AM: The top of the 1362 foot high WTC 2 South Tower topples, and unloads the lower floors, which then disintegrate. If the lower floors were so stressed as to collapse immediately after they were relieved of the weight of 30 floors, then why did they not collapse immediately before the unweighting? Perhaps because the guy controlling the detonation wanted to wait until the building was evacuated, but the asymmetric damage forced him to initiate the demolition when it was apparent the top was going to roll from the structure, and damage adjacent, still profitable structures. If these were caused by air being forced from the windows as the floors above collapsed, such lines of dust would have been expelled from the windows of each floor in succession (79, 78, 77, 76 and 75). The tilt is better shown in the photo by Jim Collins/AP (The Ground Zero Grassy Knoll by Mark Jacobson). Buildings normally topple when they collapse as the top of WTC 2 begins to do. The top unit of floors must be disintegrating, due to demolition, otherwise at least its steel core would have extended into parts of the building that are clearly unaffected by the collapse at this moment. 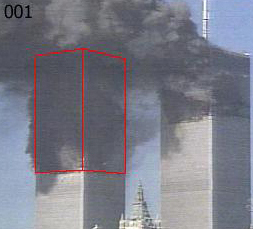 This kind of disintegration is seen more clearly in the North Tower frames. See http://www.youtube.com/watch?v=JsoWbX6hCYk. Eyewitness accounts of explosions. The lower structure was accustomed to supporting the upper structure, and was designed with a safety factor of six, so it could support six such units of material. The upper unit is disintegrating into dust, much of which falls away from the lower structure, reducing its static load. While the crumbling upper unit is adding dynamic load to the lower structure, the load is distributed and dispersed, hence one would expect the lower structure to remain standing. At worst, given the asymmetric damage, the tops of WTC 1 and 2 should have toppled. 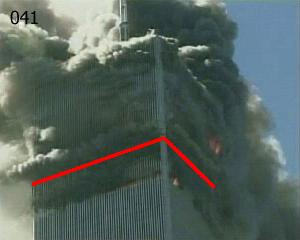 If WTC 1 collapsed symmetrically, then at most 5.3 floors of the upper section and 5.3 floors of the lower section should have compressed to absorb the impact of a free-fall of the upper section into the lower section the distance of one floor. 2001 September 11 9:59 AM: Firemen hear squibs firing, "bang, bang, bang, bang, bang," and the 1368 foot high WTC 1 North Tower collapses into its basement in 8 seconds. 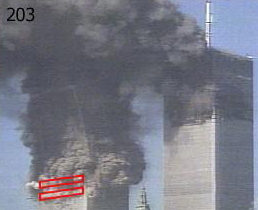 Like the South Tower, horizontal explosions of dust and debris occur just above the red line on frame 041. These continue their expansion through subsequent frames as shown in oscillating animation of frames 001 and 067. Note the explosion half-way up that section in frame 67. Note also that the radio tower sinks into the upper floors faster than the floors disintegrate, indicating that the core is disintegrating faster than the external structure, before striking the lower structure. Again, one would expect the lower floors to sustain the disintegration with at least the momentum of their mass. The core would have certainly remained intact if it were not compromised by demolition charges. Far below the collapse are jets of debris that include large chunks of concrete from the demolition of core structure as shown in the photo by Jerry Torrens/AP (The Ground Zero Grassy Knoll by Mark Jacobson). The destruction of the core must proceed that of the external structure to assure that the building collapses inward, minimizing damage to surrounding buildings: the goal of all demolitions. Such a jet is also shown in the Jim Collins/AP photo below. The "puff of smoke" about 20 floors below the cascade of falling floors is suspicious, but could be explained by a bad pour of concrete shattering under the shock of the cascade, and exploding through the windows. However, there are two jets of exploding debris on two different floors in another photo, and a consistent series of concrete jets all the way down the building the same distance ahead of the collapse in other videos (Woolworth building, ABC News views). 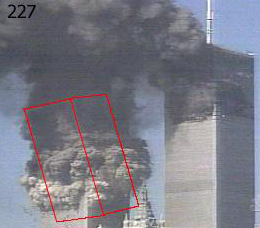 The puffs indicate charges meant to shatter the massive central core of the building, which should have been the last structure standing after the floor collapse in the PBS documentary, "Why the Towers Fell" simulation (from FEMA report) shown above. This plus the collapse time near the free fall time of 9.6 seconds lends credence to the controlled demolition theory. The 911 Mysteries video (no longer available on YouTube and recently removed from Google) includes great shots from near the base of the towers looking up at the collapse. Pay close attention to the ejecta from the core explosions well ahead of the falling debris and the perimeter explosions immediately in front of the debris. 2001 September 11, ? 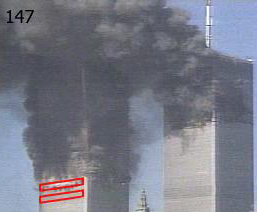 AM: Cause of collapse implanted in public consciousness immediately after the collapse of WTC 1 and 2. Why did Fox News interview the one "person on the street," who happened to delineate the structural-failure-due-to-fires theory before it was a theory? He sounds like his is reciting a script. When Ted Kopel asks if it is possible that a plane crash could have collapsed the buildings, or were pre-planted explosives required, he was immediately told of plane full of fuel was sufficient to cause each of the WTC 1 and 2 buildings to "collapse on itself" due to fire weakening structural steel. When Ted asked if it is possible for an attack so sophisticated to be done without Iraq, Iran, Syria or Libya being involved, he set the stage for the invasion of Iraq and was told the attack had "finger prints of somebody like bin Ladin", implicating bin Ladin over anyone else long before there was any alleged evidence. 2001 September 11, ? AM: "Arabs" seen cheering the crash later arrested and found to be Mossad agents. They were held, interrogated and released. They fled-removed to Israel. Three of them were later interviewed-removed on Israeli television. 2001 September 11, 11:00 AM: Firemen ordered out of WTC 7. 2001 September 11 between 11:00 AM and 5:30 PM: Larry Silvestein: I said ... the smartest thing to do is "Pull it!" (removed from YouTube). There is no confusion about the word "it". 2001 September 11, 4:00 PM: "Middle Eastern men" seen cheering the crash are arrested and found to be Mossad agents. They were held, interrogated and deported to Israel. Three of them were later interviewed on Israel television. 2001 September 11, 4:54 PM: Assuming it is correct, Time Stamp Confirms BBC Reported WTC 7 Collapse 26 Minutes In Advance, so the BBC had to know WTC 7 was going to collapse nearly an hour in advance of the event. 2001 September 11, 5:00 PM: Emergency personnel are aware of impending implosion of WTC 7. 2001 September 11, 5:10-5:20 PM (FEMA): WTC 7 collapses into its basement in 6.5 seconds. Enron stock fraud and California swindle evidence disappears with WTC 7. Silvestein later contradicted his clearly recorded statement, and said he was talking about pulling the firemen from the WTC 7 when there were none inside. 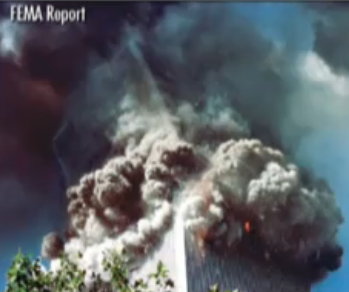 Note how the center collapses first, typical of a controlled demolition. Calculation of speed of collapse. Another angle. Pools of molten iron were found at the base of the towers. Appendix C of the FEMA report describe iron oxide and sulfur oxide found on walls. The NY Times called this "the deepest mystery of all." An EMT in the basement confirms explosions, molten metal and compromised columns. Demolition expert: "We blow the basement - all the columns in the basement. Then we crack it up at the top to get it started. We go every other floor ... all the way down." Fireman: "We have numerous people covered with dust from the secondary explosion." Rodriguez details multiple explosions. Debunking freight elevator fireball myth. Audio confirmation of explosions (visit http://www.911revisited.com/video.html in the event this video is also removed by YouTube). 118 Witnesses: The Firefighters' Testimony to Explosions in the Twin Towers. Firefighter petition. Anyone who has cut steel with a cutting torch knows the slag is blown inward. These are not clean-up cuts. These are shaped charge cuts. 2004 November 12: UL Executive Speaks Out on WTC Study - "The buildings should have easily withstood the thermal stress caused by pools of burning jet fuel." - Kevin Ryan. Letter from Kevin Ryan to Frank Gayle. 2005 August 25: William Rodriguez, a 9-11 Survivor validates multiple explosions throughout WTC 1. 2005 September 11: Bombs Inside WTC, fire officer says firemen and cops know truth. 2007 February 8: Ground Zero EMT speaks, "There were explosions. There were flashes. There was molten metal running down the I-beams of the basement levels like lava flows. I've never seen anything like it. Yes, planes hit the buildings - anybody who says otherwise is a moron. But the explosions - the rapid, symmetrical, sequential explosions - they happened. FEMA videographer at Ground Zero goes public. Short Interview with Richard Gage of the on Fox 26 in Fresno, CA. Presentation at the University of Manitoba, 9/11: Blueprint for Truth -- The Architecture of Destruction with Richard Gage, AIA.